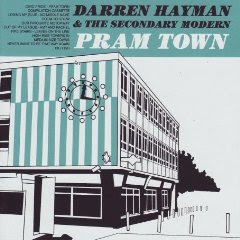 This session was recorded for 6 Music last week in support of Darren's new album "Pram Town" which is, and I hate to say these words, a concept album. It describes itself as a folk opera whatever one of those is and is all about a person who lives in and never escapes town in Essex called Harlow which apparently is the part of the world where Mr Hayman originates from (Essex boy, explains a lot). I think this is something like Darren's tenth album if you include all the Hefner stuff and probably his strongest since "The Fidelity Wars". The three tracks on this session all appear in slightly different form on the new record which is available through track and field right now. I know this is really old now, but any chance it can be reuploaded? I can't get enough Darren Hayman.